The Solid-State Sidekick Relay Module (the "Sidekick" for short) is a high-power solid-state relay module that allows you to control an AC appliance with any 3.3V or 5V microcontroller! With the Sidekick you can control AC motors, lamps, or other appliances, and it's the perfect sidekick for the Reflowduino Basic as an easy and flexible reflow oven controller! All boards ship fully-assembled! Also, this isn't shown in the pictures but the C14 connector will be anchored down by two M3x10mm screws with Nyloc nuts. The Sidekick is the perfect complement for the Reflowduino Basic or ESP32 and Reflowduino32. The Sidekick makes controlling high-power AC appliances extremely convenient and safe. Simply connect the module to the wall with the supplied C13 power cable, plug the controlled appliance into the NEMA outlet on the module, connect the two relay input wires from the microcontroller via the screw terminal, flip the power switch on, and you're ready to go! The Sidekick packs a powerful punch and can be used for high-current AC appliances. Its plug-and-play flexibility and low control voltage makes it perfect for interfacing with any popular microcontroller! Relay control voltage: 3-15VDC, perfect for any 3.3V or 5V microcontrollers! A screw terminal allows for easy and secure connection of the two control wires. Output rating: 12-280VAC output voltage range with current rating of 25A/240VAC (max spec with convection cooling), 10A/240VAC typical, or 20A/120VAC (good for any home appliance in the USA). Module power: Accepts a standard C13 power cord (included) that plugs in to the matching C14 connected on-board while the other end plugs directly into a wall outlet. The device connects the ground pin for safety. Appliance power: There is a standard NEMA outlet for the controlled appliance. The appliance is only switched on when the relay is activated. Note that if you are in a country that uses 240VAC you will need to get a 120V-to-240V adapter. Power switch: The module has a power switch that shuts off or enables the whole shebang. 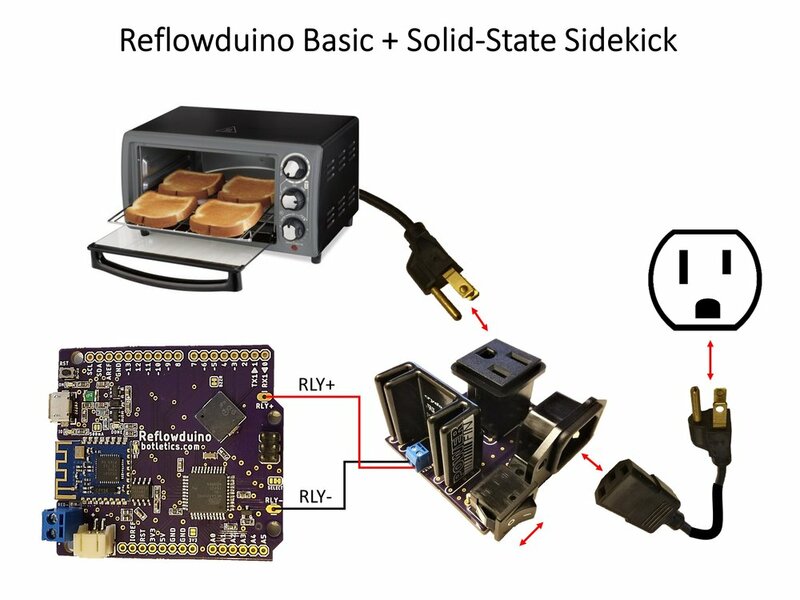 For Sidekick documentation and more information about how to use the Sidekick module with the Reflowduino or ESP32 and Reflowduino32 to build a custom reflow oven, please see the Reflowduino Github page. Safety Disclaimer: The Sidekick relay module has not yet been certified by authoritative entities and is provided as-is. Take all necessary safety precautions and use at your own risk.